Who knew that a part of Dubai sits on a hilly neighborhood by the Hudson Valley, 60 miles north of New York City. People of the surrounding neighborhoods of Newburgh, NewYork, when flying in or out of their nearby Stewart In ternational Airport, can see a replica of Dubai’s famous Palm Jumeirah laid-out in the front-yard of a neighborhood home. Indeed something unique and different, this would be the home of Mr. Rushdi Siddiqui. Mr. Siddiqui is someone unique himself, who for the last 15 years has been earning a living ‘doing’ Islamic finance globally from New York City. Mr. Rushdi Siddiqui is an Industry pioneer who has led the way of Islamic Finance’s integration with global financial platforms. 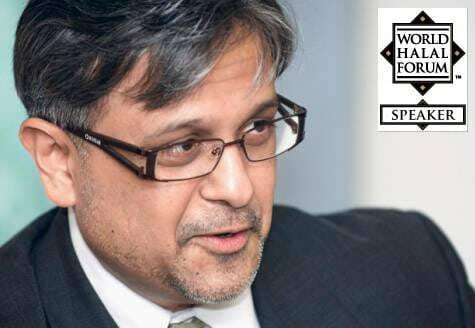 A Wall-Street veteran, and a 2nd generation American Muslim, Mr. Rushdi Siddiqui is the man who envisioned and led global business information icon – Dow Jones to launch the Dow Jones Islamic Index in the late 1990’s. While at DowJones, he also led the industry’s agenda setting International Islamic Finance Forums and others across the globe. Today, Mr. Siddiqui is the Global Head of Islamic Finance and OIC Countries at Thomson Reuters and is now passionately addressing the industry’s information flow gaps through Thomson Reuters Islamic Finance Gateway as well as other initiatives. I had the privilege of sitting down with Mr. Siddiqui for a one-on-one discussion regarding his motivations, his adventurous journey in Islamic Finance so far, his current plans, and views on needed industry priorities. Below is his story in his own words. Growing up, ‘Islamic’ was praying daily, fasting, etc. I was far removed from the concept of Islam and Finance even through my time of higher education. It was probably in the mid-1990–I had graduated from law school, and was working at a Bank as a marketing officer, not very happy. One day at a friend’s house I saw “Islamic Banker”. I was flipping through the magazine and was fascinated how you can actually put faith and finance together. Then another day, I saw a tombstone ad in the FT (Financial Times), of a listing deal with an “Ijarah” structure. This got me interested. I questioned myself, what is it that I really wanted to do in life? Do I want to go into the conventional system and just be another cog in this big machine? Or, go into an unstructured environment and try to create value and bring financial empowerment to Muslims and those interested in ethics and finance?–empowerment, which would be consistent with the traits of the faith. So I chose the latter. It’s been a challenge everyday and a challenge these last 15 years–but no regrets. I was working for a small brokerage dealer on Wall Street and my mandate there was alternative investments–including Islamic. As I was looking at Islamic Funds, there didn’t seem to be ways to measure fund performance. There was essentially no Islamic Index by an Index provider. So I did some work and wrote an article, which got published in Islamic Banker. A friend of mine saw the article and said he knew the President of Dow Jones Indexes at the time, David Moran, and asked if I wanted to meet him. The reality is, if you’re a small broker-dealer trying to create an Islamic Index on Wall Street, you’re really not going to get any traction. So I met David Moran pitched the idea but didn’t really try to impress him with the few Arabic terms I knew. I did not cheer-lead Islamic Finance and I don’t do it today. It was explaining the business opportunity; it was explaining the publicity, the revenue model; it was explaining the fact that it allows us to have an opportunity to funnel other projects in this region, the Middle East and Malaysia. Within the corporate hierarchy, there were some naysayers, but there were more pro Islamic Indexing folks who saw the business case. It was no different than having a sustainability index or a DowJones Dharma index (Hindu). Basically, DowJones had the opportunity to lead the market, with lead-time in the marketplace, and actually do some interesting work in non- competitive, non-saturated market. Dow Jones in 1997 had started to license its indexes. So it was timing as well–as is with everything in life. I came from the outside, pitched an idea, they liked it, and the rest is history. The most exciting milestone for me and team at DowJones was when we first launched the DowJonesIslamic Index on Feb 9, 1999 in Bahrain. The world saw for the very first time an Islamic Index by an Index provider. It was a great feeling of accomplishment by the dedicated people at DJI, especially the MD at the time, Mike Petronella. DowJones became the first International Index provider offering an Islamic Index with its own Shari’ah Board. Three things helped us successfully launch the Index. The first key factor was getting the right Shari’ah Board which gave the offering instant credibility in the target market. Second, was getting a credible set of licensees at the launch. It was Brown Brothers Harriman/SEDCO, and Kuwait based Wafra. They were all very supportive. These were well known brands in their space which was a tremendous boost for us. The third and most important aspect was Dow Jones leadership’s enthusiastic support. This initiative had buy-in all the way to the top of the organization, CEO Peter Kann, and you need that type of buy-in when a Western institution, who’s not involved in banking or asset management, is offering something that’s an Index. This was about two years after Dow Jones Indexes had started licensing its indexes. I knew from the beginning that you can’t basically be in this emerging Islamic Finance space and say, here it is, and the world will come to you. Not only do you have to build it, you have to promote it, and then continually promote it. In the Islamic Finance market space or the emerging market space, it is very important for you to get that traction; to get that loyalty, because it goes to commitment. So I thought, now that we have the Index, we’ve now got to have Conferences and Seminars that talk about this and hear why this is important. In essence we had to be involved in the process in terms of explaining to the conference organizers why this topic will get delegates, sponsors, and speakers to the conference. It wasn’t mere numbers/ indexing. We were talking about a phenomenon; we were talking about the beginning of Islamic Asset Management. In addition to conferences and seminars, other avenues such as media interviews and writing were also important elements that put forth a more complete offering and got market traction. You also have to continually reinvent yourself. Eventually, people were getting bored with Islamic Equity Indexes and started asking for more options. So we launched a Sukuk Index, and we also launched a Sustainability Index. The bigger point for those in the Islamic Finance space, the Halal space, the Muslim Lifestyle space is that you have to continually reinvent yourself–because that’s the commitment the marketplace is looking from you, for them to be loyal to you. The first thing that struck me was how few Muslims knew about Islamic investing or Islamic Finance. Who was formulating the message to the masses? Where was the Muslim media, focusing on matrimonials? The resistance to Islamic Finance was shocking to me initially but then as I understood the macro environment they live in, it was understandable. Conversely, some of the pleasant things that I’ve encountered are the non-Muslim institutions and the non-Muslim Governments embracing Islamic Finance with constructive criticism. They are open for you to talk about this and explain to them how this works. That was definitely eye opening. I actually got opportunities to present at places that I couldn’t get into in College and law school. I presented at Harvard, Oxford and Columbia and other such places. Those things mean a lot to me, that here are these institutions of higher learning with centuries of aura from my point of view, and they were reaching out for some of the work we were doing, to come and explain it on their platform. It’s good to leave on top. You don’t want to over extend your stay and I was looking to get back to what really excites me, which is—an unstructured environment where you create value. It’s what I was fortunate enough to do at Dow Jones 1998-1999. So we created the Islamic Indexes and they became the global benchmark and other Index providers came into that space. I see myself not as a salesperson but as an educator and a builder. So when Thomson Reuters asked me what I thought I could build, I said, to move Islamic Finance forward, another Fund, another hub, another bank, another Sukuk is not going to do it. My thinking was that to take Islamic Finance forward, we need two things. One is a neutral, global platform and commitment from top down–which is what we have here at Thomson Reuters. Second is putting forth a constructive criticism of Islamic Finance. We need to talk about economic and financial indicators of Islamic Finance. We need to talk about stress testing Islamic commercial banks, proprietary Islamic finance trading, Islamic micro-funding (not financing) etc.. This produces raw data that can be shared and learned from. Cheerleading that there is no bailout or bankruptcies in decades old Islamic Finance, therefore this is the model for centuries aged conventional space–that’s not going to work. So what attracted me here were two main reasons, a) the top-down management commitment, and b) ThomsonReuters huge global platform and therefore bigger responsibility. Again, this was going to be an unstructured environment and I was going to have an opportunity to create something that’s going to move Islamic Finance to 2.0. The biggest hurdle to Islamic Finance is not the anti-Shariah movement or the known bottlenecks (standards, scholars, qualified people, regulatory leveled playing field, etc. ), but the many Muslims themselves. Meaning, these well meaning, but unreasonable people wanting purity today, are not at all realistic. In the 57 Muslim countries we don’t have any Islamic finance economy, and we have just started talking about Shariah based initiatives. We will get to purity, but there is an interim step, where a little of impermissibility, as advised by scholars, is tolerated. For example, let’s look at the only deposit taking Islamic bank in the UK, Islamic bank of Britain (IBB), in existence since 2004, has only 50,000 customers and recently needed a life supporting capital injection from a founding shareholder, QIIB. At one level, the lack of demand for Shariah compliant products in the UK has resulted in some high street banks pulling away from Islamic finance. Now, combine this with the many graduating or Islamic finance certified students, they don’t have jobs and frustration levels are very high. If there is demand for Islamic finance products (at retail level), budgets and revenue targets are met, more hiring takes places. So, what should a student (in Islamic finance) in UK tell his/her parents about Islamic finance offered by IBB or others? The takeaway lesson from the financial crisis is that companies that are more transparent are rewarded right now in the marketplace. Companies that are not so transparent are punished because the assumption is that they are trying to hide something. So, the new paradigm is that you need to be transparent because transparency implies a level of confidence in your company, in your funds, in your country. OIC countries at one level are emerging market countries so they are competing with other (non-Muslim) emerging markets. So if I’m an emerging market fund manager in the US, the OIC has an attractive set of markets I could invest in. However, there is a dire lack of information transparency which becomes a barrier. I see my role here as furthering transparency within OIC markets through Thomson Reuters global reach. If am able to achieve this then I’ve done my job of getting the person to the watering hole. Once they are there, then it’s whatever their risk profile is, that allows them to say yay or nay. What would I do after Thomson Reuters? Obviously, stay in Islamic finance, as that’s all I know. Realistically, I’d like to build the world’s first global Islamic pension fund offering, as this would combine many things I’ve been exposed to in the last 15 years. There are so many Muslims living in non-Muslim countries, and a large percentage of them would be interested in placing their retirement in Shariah compliant instruments. Here you’re talking about the build out/up of variety of asset classes in Islamic asset management, plus financing, via Islamic PE, the $640 billion Halal industry, ‘Islamic or Halal’ hotels (must have stayed at over 300 hotels rooms in over 30 countries), and financing Muslims’ entrepreneurship (designing clothing, magazines, etc. ), lets actually use Islamic venture capital and Islamic micro-funds (over financing). This can be done for the price of one commercial tower. Copyright © 2011 DinarStandard – Growth Strategies for Emerging Muslim Markets. All rights reserved.